One of the few remaining locally owned and operated gas stations in the region, Center Tower opened in 1992, right next to Mr. Suds Car Wash. 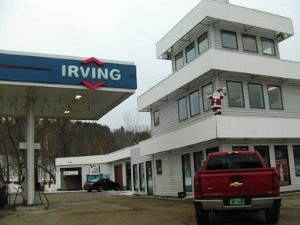 Owned by James and Lorraine Impey, Center Tower offers a convenience store, complete with onsite deli, as well as Irving-branded fuel. There is also a high-speed diesel island for the convenience of our customers. The full deli offers hot and cold sandwiches, not to mention deli special. It is open weekdays, from 7 a.m. to 1 p.m. You can find our daily specials on our web site. There is also inside tables to sit and eat and picnic tables, outside during the summer, if you wish to linger. Friendly service, with that home-town feel, is one of the characteristics that makes our store special. Slushies and self-service vanilla creamies are served in the summer. HOURS: Monday through Thursday, 5 a.m. to 9:30 p.m.; Friday, 5 a.m. to 10 p.m.; Saturday, 6:30 a.m. to 10 p.m.; and Sunday, 7 a.m. to 9 p.m.
Also owned by the Impeys, the car wash features a touchless automatic car wash and two self-service wash bays, as well as nearby car vacuums. The cost of the car washes is very reasonable compared to other areas of the state.